A waterfall feeds the lake, pouring out of the mountain but you don’t really hear it as you reach the edge of the town which has been built up around a strange building. It rests in what looks like the indentation of a huge dragon’s footprint. The sign hanging by the door shows a set of scales with red dragon scales on them. A short road heads to the Red Lake on the east side of town. It ends at a dock and a red and white river boat, or a lake boat in this case. The water wheels on the ship are a multicolor affair, but the colors are all stained red from the water of the lake. A few people move about the deck attending to tasks. 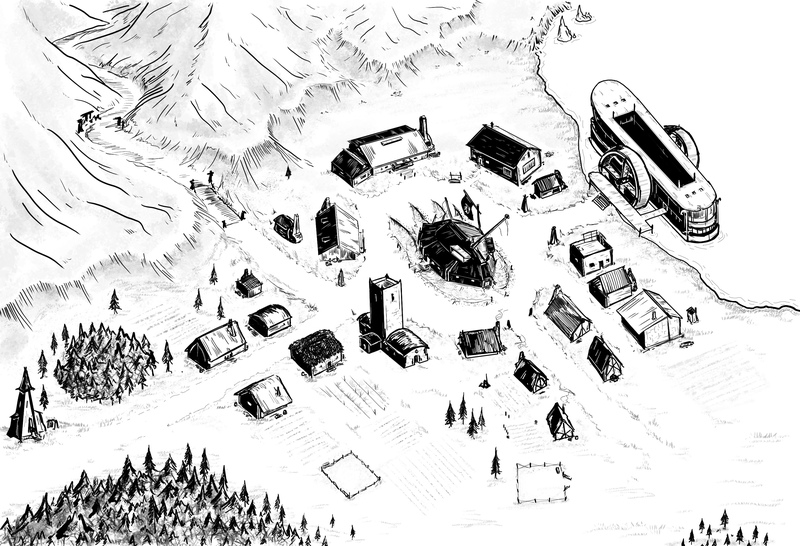 In my next few Airy Peaks articles I’ll be talking more about the town of Foot, and when the series about Foot is done you’ll have a home base town you can use for your games.